Location: Saint-Blancard, in the Gers departement of France (Midi-Pyrenees Region). Notes: Château de Saint-Blancard is a French château located in the municipality of Saint-Blancard in the Gers department in Languedoc-Roussillon, Midi-Pyrenees. It is a listed building.The site has been occupied since ancient times and throughout the medieval period (based on excavations in 1889). A castle existed in the thirteenth century. In 1303, an agreement was signed between the villagers and Pierre Orbessan to build a new castle. Masonry are made in the fourteenth century (most of which has been preserved). The perforations are made in the sixteenth century. Marshal Biron, beheaded for plotting against Henry IV after having served, was born there in 1562. He suffered a fire in 1888. During the reconstruction, the dungeon is created to the west and the neo-Gothic interiors are made. At that time, the western and southern walls are felled to clear the view of the Pyrenees. The common and the new greenhouse were built in the late nineteenth century. The last speaker portion, a copy of the second chamber of Carcassonne, in 1926. 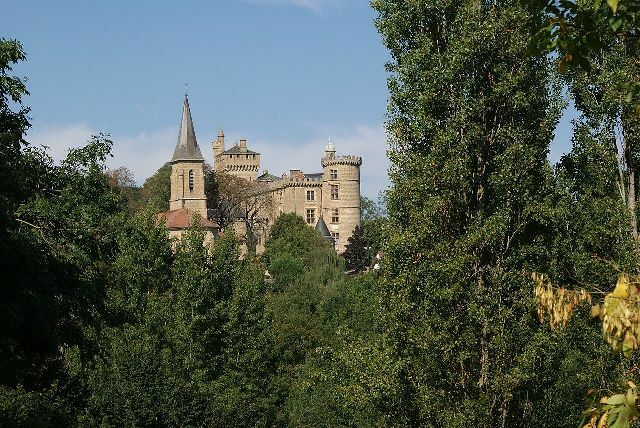 During World War II, the castle of Saint-Blancard plays an important role, through the ingenuity of Jaujard Jacques and Christiane Desroches Noblecourt, in preserving the works of the Egyptian Antiquities Department. On 22 October 2000, an association created to defend the castle and its park, abandoned for some years by the British company that has bought. The website of the association (http://chateaudestblancard.weebly.com/) was created and published April 6, 2015. It is classified historical monument since November 23, 2005.